My mother took us kids to see him at the National Orange Show in San Bernardino. As soon as she noticed he was helpless without cue cards, she grabbed my little brother and sister and walked out (I refused). He had a stable of writers whom he kept on retainer 24/7. Never knew when he'd need a joke! I loved Bob Hope. During the 1970s I recall watching his movies. Him and Bing Crosby. Movie titles don't spring to mind as I type this. 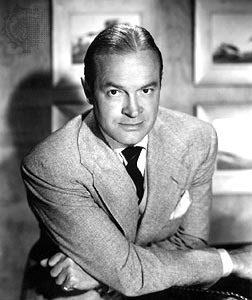 Bob Hope was one of the best funnymen in television history. Despite the fact that he was from England,and some how became the most respected "American" in preforming for the last five or six American Presidents,and living to be 100 years old before he died,I would say that he was the greatest man on earth!